Step 1 Heat the oil in a large heavy-bottomed nonstick skillet over medium-high heat. Slice the onion in half lengthwise, then thinly slice each half crosswise. Add the onion to the skillet, stirring well to coat the slices with oil. Reduce the heat to medium and cook until the onion is light gold, about 10 minutes, stirring frequently. Step 2 Meanwhile, slice the corned beef against the grain on the diagonal into 1/4-inch slices. Set aside. Mince the garlic. Step 3Add the garlic and the brown sugar to the onion, stirring well. Cook until the brown sugar is bubbly and the onion is coated with the mixture, about 2 minutes, stirring constantly. Stir in the cloves, allspice and mustard. Add the beef broth and stir well. Carefully place the corned beef slices in the skillet. Bring the sauce to a simmer and cook until the mixture thickens and is almost syrupy, about 10 minutes, stirring occasionally and turning the slices over once. Step 4Remove the pan from the heat and stir in the orange juice concentrate and the Bourbon. Return the pan to the heat just long enough to warm the Bourbon, about 1 minute. Do not boil. Divide the corned beef among serving plates and spoon the onion and sauce over the top. In Recipes-list.com we have selected the most viewed recipes from category - Leftovers Main courses Quick and easy . Enjoy the best recipes specially selected for you! 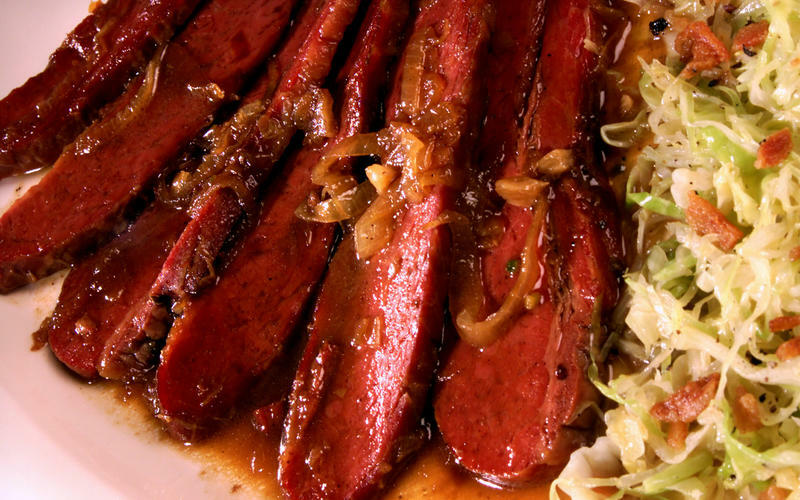 Corned Beef in Bourbon-Brown Sugar Sauce is the right choice that will satisfy all your claims.